With years of development, the IOT (Internet of Things) technology is widely used. IOT is the general term of a system consisting of objects (sensors, chips, and gateways), Internet connection, cloud/data center. Among these, the part of objects can be very fragmental. Gateway can integrate information collected from different objects. Internet can transmit information among each part and cloud/data center can analyze and provide solutions. Combining these 4 parts, it will become a big platform that can achieve deployment, analysis and application. This is the core structure of IOT. After powered the gateway and built TCP connection with server, the gateway will automatically scan surrounding BLE device. And upload MAC address device name, broadcasting type, broadcasting content and in time signal power to server. 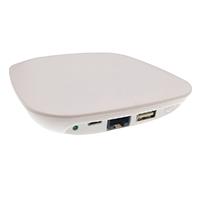 It can monitor the device conforms to the BLE standard. Bluetooth applied to the worldwide open 2.4G band, so its operating cost is almost to zero.